Research and clinical trials are essential for the advance of medicine. The effectiveness of each new breakthrough can only be assessed by putting them into practice with individuals affected by the disease. For those who care about vasculitis and discovering new ways to identify, diagnose, and treat these diseases, there are many ways to support the advancement of research. Volunteer participation in clinical trials is one way to help progress knowledge about the various types of vasculitis. As a volunteer, your participation can help potentially new, successful treatments become available to others who understand living with vasculitis as you do. For certain non-medication based studies, a volunteer may be any individual who is willing to participate. Volunteers can be spouses, friends and family members who wish to make a difference in vasculitis research. From the definition of a clinical trial to information and questions that are good to ask your doctor before participating in a trial, this section address many of the common questions that arise when deciding to join in supporting vasculitis research. A clinical trial is a type of research study. Clinical trials test a new treatment and compare it to the available treatment (the usual way doctors treat a certain health condition or disease). For example, a clinical trial might study how well a new medicine helps people with cancer or if certain foods help people stay healthy. The Food and Drug Administration requires clinical trials before a new medication can be approved. Sometimes it is necessary to compare an experimental treatment with a placebo (inactive treatment) when no standard treatment exists. FDA Consumer magazine published this article “Inside Clinical Trials Testing Medical Products in People” which may assist in understand the purpose, process and procedure of clinical trials from the Food and Drug Administrative’s perspective. receive some medications at no cost to you; and help answer research questions that may mean better health for people in the future. There are risks to you when you take part in a clinical trial. The study doctors and coordinators will watch you carefully for any changes in your health. You are always free to leave the study. The risks will vary depending on the kind of trial you join. Here are some possible risks. You may have side effects (health problems) from taking a new medicine or getting a new procedure that is being tested. There may be side effects that are unexpected. Usually you will need to give blood samples. Some people find that process uncomfortable. The visits for the clinical trial may be frequent and time consuming. When beginning any study the doctor, or investigator, must ask approval from an Institutional Review Board (IRB). The IRB is a committee of doctors and other medical personnel that have no ties to the study. The IRB makes sure the study is as safe as possible and that the “informed consent” explains all of the important information to the patient. Before people join a clinical trial, they go through something called the “informed consent process”. This process means that you are given written information that tells you about the purpose of the study; risks and benefits of being in the study; and what will happen to you in the study. You will be given an informed consent form, which you will need to read over very carefully. Take the form home and share it with family members, friends, and your primary care doctor. Once you have read the form, ask questions about words or procedures that you don’t understand. Another part of the informed consent process is that you can ask questions about the study at any time. It is your right to have all the information you need to make your decision about whether or not to take part in a clinical trial. Don’t let anyone pressure you into taking part in a clinical trial. The choice is yours. What if I decide that I don’t want to be a part of the study, even though the study has already started? That’s okay. You can change your mind and leave the study at any time. Remember that being a part of a clinical trial is always your choice. Your relationship with your doctor will not change because you decide to leave the study. Your care will not be affected in any way. Many different people take part in clinical trials. People who take part in clinical trials are volunteers who meet eligibility criteria for the study. Eligibility criteria are requirements that someone must meet to be a part of the study. Some examples of eligibility criteria are having a certain disease such as Wegener’s Granulomatosis (WG); not showing improvement on standard WG medications; being a certain age; or being in good health. These criteria help make sure that the study answers the right research question. Is it safe to participate in a clinical trial if trying to conceive a child or pregnant? Check with your doctor or the study coordinator to find out if it is safe to participate in a particular study if you are trying to conceive, if you are pregnant or postpartum. If the trial is assessing medications, there is often concern about how medicines used in a study could affect a pregnancy regardless of being male or female. The informed consent form should tell you if any of the medicines in the study could affect a pregnancy. For women, if you are postpartum and breast feeding, check with your doctor to make sure it is okay to breast feed your baby while you are taking part in a clinical trial. Don’t be afraid to ask questions about safety. 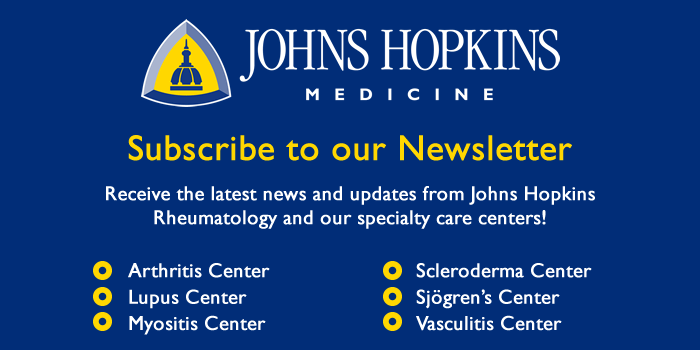 How can I find out about clinical trials or other research studies at the Johns Hopkins Vasculitis Center ? If you would like more information about one of our research activities or if you would like to be a participant, please contact the Johns Hopkins Vasculitis Center.